This game is for you if you love non bloody fight games that require almost no effort. The enemies increase in power- and coolness- as the game goes on. Each enemy design except the big boss is reused 3 times in the game but in creative ways. I will now list the enemy designs i liked and the guys using it: Nunchuck lizard:Ninja reptile, Warrior reptile, and Reptile legionnaire. Green bean:Young bean, Walker bean, and runner bean. This match 3 game is loaded with colorful, and funny looking adversaries! Your hero travels through a land filled with odd creatures you must "fight" with by taking turns on a match 3 board. You earn hp and level up your hero with armor and weapons. The music matches well with the game and is not annoying. Good game for all ages, not too scary for younger players and still challenging enough for older players. Not a dark, deep game though, if that is what you like to play. I have replayed this a few times and have not tired of it. This game is loads of fun. You fight diffrent cute, But unusual caricattures. You match 3 or more items to get money,life, things that will help and defend you. I play this one over & over. Great for the whole family. I hope they make a Puzzle Hero 2 ! ! This is the first match 3 game I found that has a "quest". I love it. I wish to find more like this. I prefer games that have a goal/quest on top of playing a game. This was one of the first BF games I owned and it has been hard to find another game that I enjoy playing over and over. The basic story is a young woman turned warrior who confronts the evil minions of the sorccerer who has kidnapped her younger brother. During the game you slowly build up her skills, strenghts, and armor by buying accessories that are rated in various ways (very much like RPG). I have come to realize that it is somewhat unique as far as M3 games go in that instead of collecting points, levels, or items to "improve" some static scene off screen -- You don't build a farm or decorate a house, Nope -- You are involved in a duel with a comical but "deadly" foe. 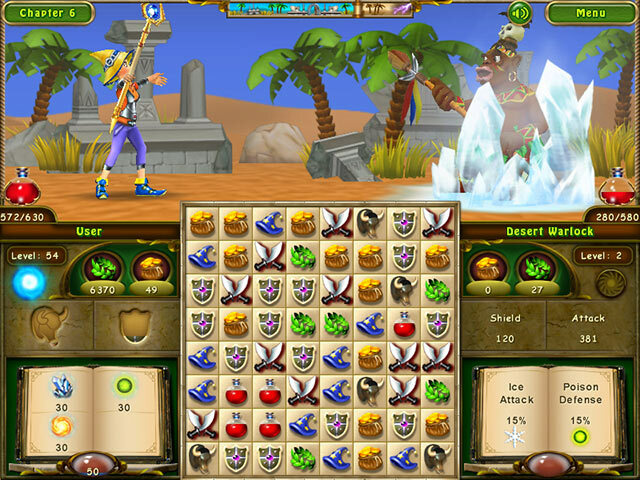 The duel is fought as each avatar takes turns matching the items he or she needs in order to combat the opponent. For example, the hats build your magic so you can blast a bolt of energy at the monster. As you progress you must evaluate the foes resources and reconfigure your own armor and magic ratungs. Oh yeah, you also need to collect money in order to buy the various shields, swords, and magical jewelry. It is a huge draw with many of my friends and I am always reminded to bring it along when we go on road trips. But... I am a teacher, k-HS, and have also used this game in my math resource area....it is a favorite. 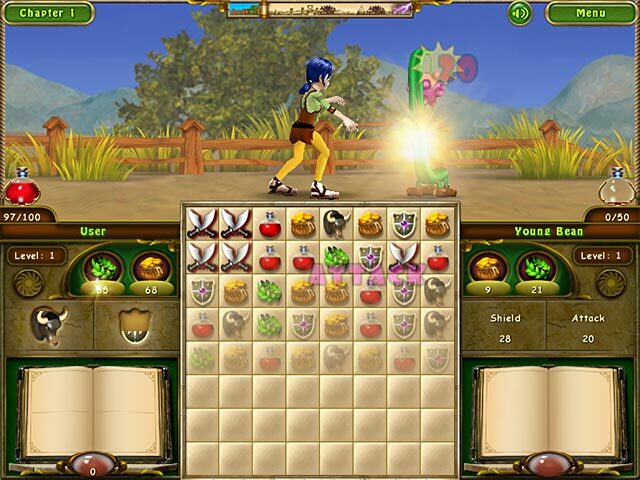 The younger kids love the character and sound effects and simply match 3 and collect gold for shopping but as they get older they revisit it and play more stratigically by actually considering things like the fire vs the freeze strength or how much increased life force a shield may convey. I have tried changing this game out a few times but it is the ONLY game that all my age levels miss and insist on having it reinstalled. sigh...I beleive it spoiled me. I have yet to find another M3 game that is half as intriguing or fun. Great for one of those games you can just play and zone out. 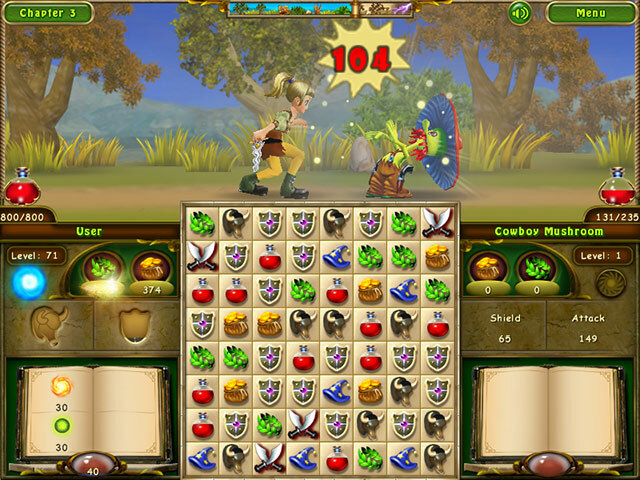 Basic Match 3. The adding of armor is fun.